This journey involves extensive travel with long flights and travel days. Temperatures will range from comfortable to very hot and humid. Travel in the Outback can be strenuous, involving rough roads and hot conditions. Hotels are comfortable and the locals very friendly. 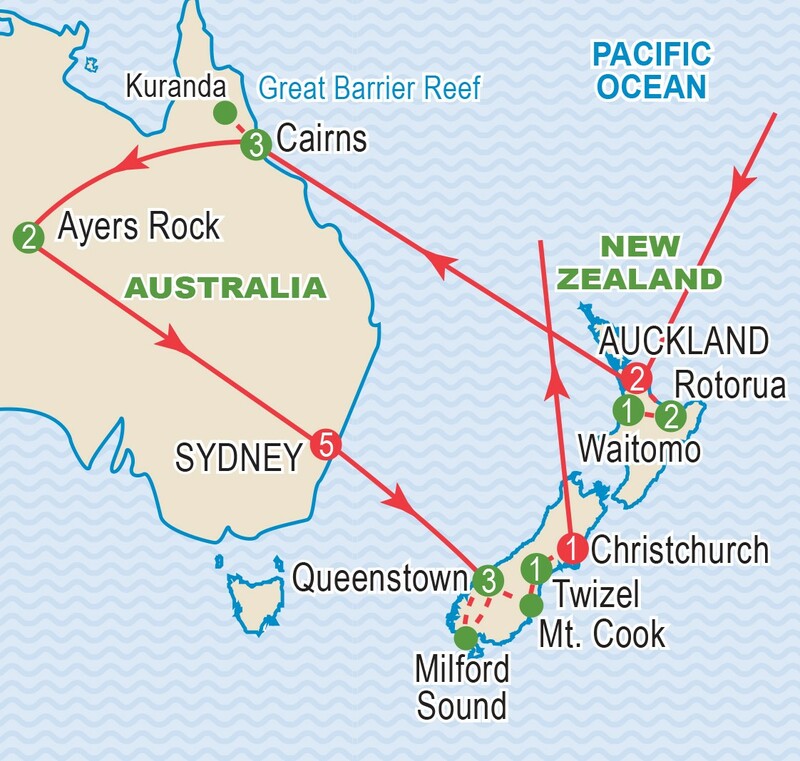 Join us as we journey to the “Lands Downunder”, combining visits to two vastly different but enchanting lands. This has been our most popular tour for the past three decades. Designed with you in mind, our itinerary features a majority of two or three night stays while ensuring that we are providing in-depth experiences of these fabulous lands. The tour moves at a leisurely pace while providing a host of special outings and meals. From your arrival in Auckland, through the outback, and to the dramatic lands of the South Island, you will find that every detail has been carefully arranged to provide a truly insightful visit of both New Zealand and Australia. Quality hotels, warm friendly people, and a carefully planned itinerary, combine to make this the journey of a lifetime! Read on...but don't delay. This tour always fills quickly. Tour members from across Canada gather in Vancouver and fly to Auckland. Lose a day en route to Australia. This morning we will be introduced to the delights of New Zealand’s most populous city. Highlights will include the National Museum with its excellent Maori displays, and a visit to the observation deck on the Sky Tower. Enjoy a free afternoon - we suggest a ferry ride to Devonport. This evening we will be treated to a Welcome Reception and dinner at the Harbourside Restaurant. This morning we will take in the sheep show at the Agrodome and enjoy the gondola ride to the Skyline Restaurant where we will enjoy a delightful buffet lunch. At the Rainbow Springs we will experience New Zealand’s unique flora and fauna (including the nocturnal Kiwi). With a free afternoon we can enjoy the thermal baths or possibly take a helicopter ride over the region. Embark on the catamaran Quicksilver and journey to the outer edge of the Great Barrier Reef, the largest and most spectacular undersea garden in the world. View the coral and sea life by glass-bottom boat, or better yet, while snorkeling. After our scenic rail journey to Kuranda through the Barron Gorge, we are taken into the rainforest to a wildlife park to see a variety of native fauna and to be entertained by the Pamagirri Aboriginal dancers. Following our bush BBQ lunch, we return to the lowland on the Skyrail with close up views of the rainforest. Enjoy vistas of the Rock before exploring Kata Tjuta (the Olgas) where we will take a walk deep into the gorge to experience the vastness of the landscape. On our way back to the hotel we stop for views of the Kata Tjuta and sand dunes before reaching the cultural centre to learn more about Aborigine history, law, language, and art. This evening we ride camels through the desert with Uluru and Kata Tjuta as our backdrop. This morning we discover the charms of Sydney, from its historic centre through the posh inner suburbs to the Heads and its famous southern beaches. Enjoy a luncheon harbour cruise, followed by a guided tour of the symbol of Sydney, the iconic Opera House. We can then return to the hotel or visit the Historic Rocks district. Our hotel is ideally located just steps from excellent shopping and the excitement of Darling Harbour. The balance of the day is at leisure. This morning we discover two of the cities best beaches with a walk from Bronte to Bondi beach along the magnificent Sydney coastline. Following some free time for lunch we return to our hotel for an afternoon of leisure. Our first visit today is at Featherdale Wildlife Park where we can get up close to Australia’s wildlife; stroke a koala and hand feed kangaroos, wallabies and emus. We then drive inland to the Blue Mountains, passing picturesque villages and enjoying spectacular views and waterfalls while hearing about the unique Australian forest species. Enjoy lunch at the Hydro Majestic Hotel with magnificent views. We stop at Govett’s Leap to view the 180m waterfall. Our last stop is the delightful Mt Tomah Botanical Gardens to enjoy the local flora and a toast before returning to our hotel. Enjoy a full day a leisure. Take a stroll in the Botanic Gardens, discover the excitement of Darling Harbour or explore the wonderful shops of the Queen Victoria building, just steps from our hotel. This evening we will gather for dinner at the Waterfront Restaurant. Enjoy a full day at leisure - ride a jet boat on the Shotover River, take the Gondola to Bob’s Peak or stroll by the lake in the beautiful Botanic Gardens. This evening we cruise across the lake to Walter Peak sheep station on the ss Earnslaw where we enjoy a sumptuous buffet dinner. Travel through the rugged grandeur of the Hollyford Valley to Milford Sound. Enjoy a picnic lunch as we cruise to the sea, past towering Mitre Peak and cascading waterfalls. This afternoon we return to Queenstown by coach or as an option you can enjoy a flight back to town. Enjoy a leisurely start this morning before visiting the Antarctic Centre for an in depth visit. Enjoy a ride on a all-terrain vehicle and visit the penguins. This afternoon we catch our flights back across the Pacific. Regaining our lost day, we arrive in Canada. **Members joining from these cities may receive an overnight hotel stay in lieu of home city transfers. Airfares from other gateways are available on request. Airfares and air carriers are subject to change and will be confirmed prior to final payment. Refer to inclusive features for details. Land Only price includes all internal flights. Tour price is based on sharing a twin-bedded room at hotels. Prices are based on a minimum 20 members and on rates, taxes and fees effective January 2018 and are subject to change due to factors beyond our control. Prices DO NOT INCLUDE the cost of insurance which is available and is highly recommended. Premiums vary with the cost, length of the trip, and the traveller’s age. For passengers up to and including 74 years on departure date, premiums will range from $525 to $663 pp plus applicable taxes. Cost supplements for travellers aged 75-85 will range from $252 to $516 pp plus applicable taxes. Clients 86 years and older and/or clients residing outside Ontario – please contact our staff for procedures. This insurance is effective from the date of purchase and carries limitations on pre-existing medical conditions. Please discuss your insurance coverage prior to booking. Refer to terms and conditions for more details.